Give your talent a perfect direction with the best songwriting software which we are going to discuss right in this article. Rhyming is not the only essence of a song. If you know about the technicalities related to it and want some help with it then you should better refer to these software. I think they are by far the most creative collaboration of technology with modern day requirements. Talking about various options regarding these software then you can find number of them but not all of them fits into this criteria of being free and functional at the same time. So, I came up with these 15 options which you would surely want to try out. It is the time to write that song which you always wished to write but never had enough help and guidance for it. Through the songwriting software like Hookpad, you get to use the best tools in the current time for creating an intelligent musical sketchpad. The software helps you in creating superb melodies and songs progression which makes the entire creative process of songwriting much simpler than it was before. There are still people who believes in the traditional method of instrument and a notepad but I think you should definitely try out this one. Along with being a freeware you also get to use its built-in music theory which already has various sounds that you were looking for. I think it not only fasten up the process but also increase the efficiency too. One of the most loved and explored songwriting software is Muscescore. Through this tool you can create, play and even print the beautiful music sheet of your creativity. It is highly related to creating music notations which makes it reliable as well as perfect creative help for your process. The software comes with no limitations and its entirely free services keeps you going for hours. I think it is just perfect for beginners because of its easy to use interface. In fact, Musescore also supports transferring files from other programs directly which establishes a highly flexible work-flow for you. You can definitely call it a professional music notation software with the least hassle and struggle possible. Finale Notepad comes under the various music related software provided by Finale Music but only this one is free out of them all. This free songwriting software allows you to directly import the musical notes of various instruments from other programs and tools. With this collaborative approach and a very linear and simple interface, you will find it super handy to use Finale Notepad for your creative process of songwriting. I think it reduces great amount of hassle for you as the Notepad Setup Wizard setups the score automatically for you. You can also playback music and can print the sheet directly from it. You are going to find it super helpful to shape your musical imagination. You can call Song Sharpener as more sort of an assistant which can improve your entire process of songwriting. It shifts the manual process to automatic ones which of course saves great amount of time for you. It is 100% free to use and helps you to write music for your tracks too. You can save all your ideas into the software to use them later. Along with updated techniques you can rely on Song Sharpener for multiple other features too. Some of them are word suggestions, 10 instrumental songs pre-recorded, tips and tricks, song starters and a lot more. However, I think it is as not advanced to use as other software are especially for the music notations creation. The next one to grace this list of songwriting software is Crescendo Music Notation Software. Along with helping you out in the songwriting process you can rely on this software for the creation of music notations too. And you do not even need any additional technical knowledge for it. With an intuitive interface you can easily arrange your own pace of quality music sheets which works as a sketch for a much professional aspect. You can easily write, compose and save your work in here and with the pre-loaded music here, it will be simpler for you to fasten up the songwriting process. You can adjust notes, scores, create chords, sheet music in treble, bass and can perform a lot of other functions on this software. Unfortunately, Songwriter’s Pad is not an entirely free songwriting software and you get a certain time period to test its trial period. The actual software is going to cost you $99 but I think you are not going to find anything more powerful and more advanced than this software in this entire list. Songwriter’s Pad helps in reducing a lot of frustration and time taking process required in songwriting and turn everything into a more organized and simpler process. It comes with 5 songwriting tips to give you a good start for your work. In fact, after the free trial process ends you can still claim the full money back guaranteed if not satisfied with this tool. With multiple tutorials and various beats and scores I think you are going to love this software. I think Verse Perfect is the least technical song writing software mentioned into this category here. This is more suitable for a creative process of just songwriting and does not relate to any music notations and scores and notes creation. However, it is definitely quite fast and powerful when it comes to just pouring over the entire literature over the user. From hyperbolic thesaurus to various rhyme options, I think you will be able to write a song in just minutes if you have perfect ideas for it. Available for absolutely free this software is a collaborative result of various authors and hence brings a lot of options of perfect words for your song. Another software which you can use for the process of songwriting is Master Writer and of course it works for free too. Not only songwriting but you can use this for lyrics creation, poem writing and even creative writing too. I think it is highly related to Verse Perfect in terms of functioning and has a more non-technical approach in its process and features. You can find a rhyming dictionary here carrying more than 100,000 entries and 36,000 rhymed phrases. The intuitive and highly simple interface is another benefit here to make most of this software on your own. However, you can use it for free for only 10 days. Jammer Songmaker is an option of songwriting software created for the Windows platform which allows the user to access their huge software library for absolutely free. You can find various versions of this software and you can decide it according to your requirements that which one is suitable for you. To be true, it is highly used for music production but I think it won’t disappoint you in terms of songwriting too. However, it is more technical in nature as well as process. You can consider it as a more enhanced musical composition engine which brings various features for your creative process. You can also discover from their 116 band style files and 53 drum style files too with various other features to explore too. Ludwig is kind of a less heard but a good enough songwriting software which can be used by windows users. Ludwig requires you to enter or play a melody of your own and it does the rest of the work for you. It also comes with both free as well as paid versions too. The software more relies on artificial intelligence for its approach and hence you are going to find everything more organized and step by step instead of clumsy. You can refer to the various boards in the software to perceive various styles in your song. If you are not able to come up with a melody of your own then you can also check out about 450 public domain songs installed in the software itself. Still looking for songwriting software free? I think you should check out Chordwizard Songtrix then. For the free accessing you can refer to its Bronze Edition which gives you an option to explore the world of music for absolutely free. The software comes with a visual interface which makes it easier and faster for the user to get adapted according to it. However, it is kind of technical in approach but it won’t take you long to understand it. Chordwizard Songtrix also helps you in creating your own rhythms and melodies or to use the pre-loaded ones. I think the software helps in way more than just songwriting and covers various different aspects. OpenSong is a free and open source songwriting software which helps you in managing and creating lyrics, overheads, chords, music notations, music sheets and much more than that. It comes with multiple features for not only lyrics creation but for various other aspect of music. You can play melodies and print them in form of music sheets. It is too simple to customize the fonts here. In fact, the same customization applies to the interface and theme of the software too. Available for various OS, OpenSong is definitely one of the most reliable software for songwriting and I think you should totally give it a try. Four Chord Songs is a part of Chord Pulse which is a music production software. However, as the later one entirely is a paid program, you can use Four Chord Songs for absolutely free but it comes with its own limitations. This songwriting software helps with a lot of aspects of songwriting and music notations like creating your own chords, experiment with built-in 50 music styles, loop length adjustments, song key, tempo and a lot more relatable aspects. However, I personally feel that it should be used for beginners only to let them understand the process more effectively and easily. You are not going to find advanced features in here. Where other such software are kind of clumsy and overwhelming to use, you are going to find Easy Song Writer as one of the best songwriting software with a step-by-step approach. Apart from creating songs, you can also record the songs through it. However, this one is for novices only and does not contain that much advanced of technical aspects of songwriting in it. You can rely on Easy Song Writer to add variations and variety in your existing songs. It helps you in creating multiple versions of your song and add some effects in it. I think this is kind of enough to learn for a beginner here. The last option that I picked for this list of TuneSmith. It is a definitely simpler helping hand to fasten up your creative process of songwriting no matter where you are. It comes with this lyrics editor with tons of features in it which are quite helpful in enhancing your songwriting experience. You can also install Rhyme Genie with it as a plug-in to help you out with other technicalities of music notations and chords. You can find more than 4K guitar chord charts in here along with great customizing features and bass notes. 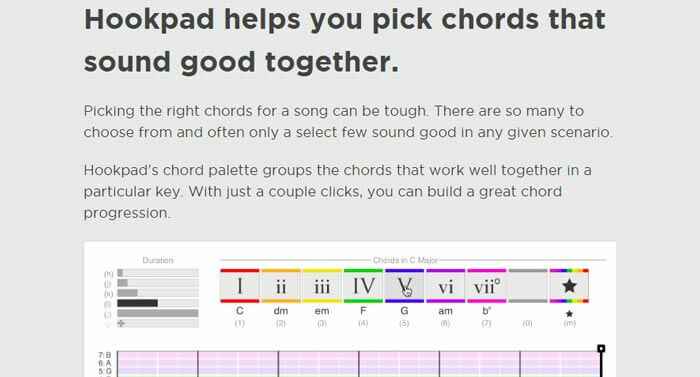 I think this is such an effortless software where you can learn a lot about songwriting. From providing synonyms to showcasing the entire dictionary for you or to help you with the rhyme, these songwriting software are capable to capture every essence of song writing very well. I think it is the time for you to be the master of words and chords! I have used ScoreCloud to try and get my melodies on a document to print them. The difficulty I have with it is that when I try to play it and import it to the software, it requires a rigid unaltered beat for the notes to be correctly recorded for their note value and placement in the measures. It’s frustrating and makes me need to put each and every note on my using the computer mouse instead of playing it on my keyboard. Does any of these songwriting software programs you recommend work easier than ScoreCloud regarding this issue I have. I could write all my music out by hand but it takes so long and I have enough musical background to know there must be an easier way to get the product I desire with the music I write.